What is Creation Apparel ERP? Creation Apparel ERP is a fully-integrated software designed by Micar Computer Systems for textile, clothing, and footwear industries. It’s an advanced Enterprise Resource Planning (ERP) solution built as an extension for fashion businesses looking for a highly configurable bespoke platform. The application helps business overcome the shortcomings of conventional software systems to eliminate errors, boost productivity, and gain control of every operation. It’s an intuitive and user-friendly software that empowers businesses of all sizes to manage purchasing, inventory, importing, manufacturing, distribution, financial control, and sales. Creation Apparel ERP is an enterprise-level solution, built on trusted mechanisms to meet the exact individual needs of every business. Some of its main features include Creation EPoS, Creation Textile, component control, stock control, production control, purchase order management, financial control, order processing, and Creation mobile Apps. Creation Apparel ERP is a powerful yet user-friendly platform embraced by leading global organizations thanks to its numerous benefits. It’s an ideal solution for businesses looking for the perfect upgrade from the basic application with inadequate functionality to a complete enterprise-class solution. The software is highly configurable and is built to provide advanced functionality and meet the exact requirements of your business. One of its notable features is the tailor-made Creation Apparel ERP point of sales module (EPoS). This is an advanced EPoS solution that offers an intuitive and well laid out interface. The module leverages robust technologies to facilitate a streamlined checkout process for seamless customer experience. It is also highly scalable and can be customized to serve one store or 100+ branches. The inventory management module offers fast access to detailed product inventory. It allows you to manage and maintain accurate inventory records and attach images to the inventory. The module exhibits impressive capability and can be used in multiple locations including retail premises and warehouses. Better still, Creation Apparel ERP allows you to generate a range of reports and analytics that provide key insights to aid decision making. Its reporting and analysis abilities cover all the key facets of your fashion business. You can easily create reports based on supplier orders, customer orders, dispatched orders, and free stock. This permits the creation of detailed reports that empower you to track inventory & products, manage cash flow, optimize the efficiency of suppliers, control production, and generate managerial & department statements. 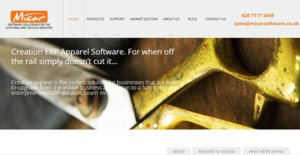 If you are considering Creation Apparel ERP it might also be sensible to analyze other subcategories of Best Apparel Management Software gathered in our database of B2B software reviews. It's crucial to note that hardly any service in the Apparel Management Software category is a perfect solution that can match all the needs of different company types, sizes and industries. It may be a good idea to read a few Creation Apparel ERP reviews first as specific solutions might dominate exclusively in a very narrow group of applications or be prepared with a really specific industry in mind. Others may function with a goal of being easy and intuitive and consequently lack advanced functionalities desired by more experienced users. You can also find apps that focus on a wide group of users and give you a powerful feature base, however this frequently comes at a more significant cost of such a service. Ensure you're aware of your requirements so that you select a solution that offers specifically the elements you search for. How Much Does Creation Apparel ERP Cost? Micar Computer Systems doesn’t provide Creation Apparel enterprise pricing details. Contact the vendor for a detailed pricing structure. We realize that when you make a decision to buy Apparel Management Software it’s important not only to see how experts evaluate it in their reviews, but also to find out if the real people and companies that buy it are actually satisfied with the product. That’s why we’ve created our behavior-based Customer Satisfaction Algorithm™ that gathers customer reviews, comments and Creation Apparel ERP reviews across a wide range of social media sites. The data is then presented in an easy to digest form showing how many people had positive and negative experience with Creation Apparel ERP. With that information at hand you should be equipped to make an informed buying decision that you won’t regret. What are Creation Apparel ERP pricing details? What integrations are available for Creation Apparel ERP? If you need more information about Creation Apparel ERP or you simply have a question let us know what you need and we’ll forward your request directly to the vendor.